Remember: In 1917, Jews constituted 7 percent of the indigenous Palestinian population and owned 1 percent of the land. Britain, as a colonialist power and the victor of World War I forced the Palestine Mandate and gave itself the right to grant a homeland to the Jewish people in Palestine in "Balfour Declaration" that facilitated the colonization of the land by foreign Jews. The 1948 War that led to the creation of Israel over seventy-eight percent of Palestinian territory resulted in the devastation of the Palestinian society. More than 80 percent of the Palestinians who lived in the part of Palestine upon which Israel was established became refugees, their society disintegrated and their lives at the individual, community and national level were changed. The Palestinians in the West Bank and East Jerusalem came under the Hashemite regime while those residing in the Gaza Strip came under uncaring Egyptian administration. Then after the 1967 war, Israel brought these regions under its military occupation, and the Palestinians ended either refugees or under occupation. 'A French court will be looking into the case of Mohammad Ad-Dorra, 12, who was killed after being repeatedly shot, on September 30, 2000, while seeking shelter from Israeli military fire in his father’s lap; the father was also shot by several rounds. 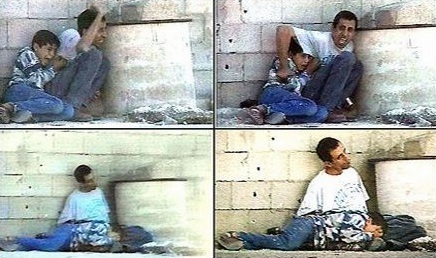 Eleven years ago, French reporter, Sharl Anderlan, was present at the shooting, and, along with his Palestinian Cameraman, Talal Abu Rahma, videotaped the incident. Anderlan was later accused of fabricating the video, despite the fact that the shooting took place in broad daylight in front of several persons, and reporters, who were also witnesses to the incident. 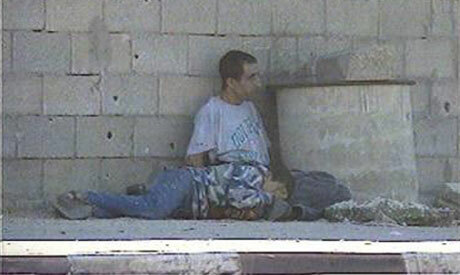 Mohammad Jamal Ad-Dorra was born on November 22, 1988, and was shot dead on September 30, 2000. He and his father were walking in Salah Ed-Deen Street, in Gaza. Observe the ambitious yet poor marksmenship of the child murderers. When the shooting started, they tried to take shelter behind a concrete barrel and the father started waving to the soldiers, trying to indicate that he was a civilian with a child, but the shooting did not stop. The father could not fully shelter the child, and both of them were shot by several rounds of live ammunition. Time to prosecute the parasitic state for this crime. Then it's on to the Hague for more war crime tribunals. Do them alphabetically - the parasite first, then it's host. The rationale for this book is simple: information for action. “Targeting Israeli Apartheid is the guide many of us in the movement have been waiting for. This forensic, clear and systematic account details the where, who, how and why of the flows of capital and contracts which enable the colonisation of Palestine to continue." 'The book begins by examining the Israeli economy industry by industry and suggesting where the movement should focus its campaigning energy in order to be most effective. Part two contains five in-depth geographical case studies. The final section looks at how campaigners can bring the fight home to the UK. BDS = The global movement for a campaign of Boycott, Divestment and Sanctions (BDS) against Israel until it complies with international law and Palestinian rights was initiated by Palestinian civil society in 2005, and is coordinated by the Palestinian BDS National Committee (BNC), established in 2007. BDS is a strategy that allows people of conscience to play an effective role in the Palestinian struggle for justice. 'A strange affliction seems to be affecting settlers in the West Bank. It seems that as soon as they are granted settler status (a badge of dishonour in the eyes of the rest of the world considering the illegal nature of all settlements) these individuals lose all ability to drive in a calm and reasonable manner and instead become lethal menaces on the road. barely register as a blip on the radar. 'Israel’s High Court rejected a legal challenge to the Citizenship and Entry into Israel Law, by a six to five vote. The law, first passed as a ‘temporary’ measure in 2003 and renewed ever since, prevents Palestinians from the Occupied Territories (and those from ‘enemy states’) from living with their spouses in Israel. Southpark, if I may make a suggestion: why don't you start a new thread named something like "Current Important World Events from Southpark Point of View" and post all your links there instead of cluttering the entire Message Board? That way we will have easy access to all very important links that you happen to come across. Note: I tried to locate this dump on Google Earth. The resolution is much lower over the area. I could not zoom in. Try it yourself. Related: The essence of Apartheid in Qaryout village. Crimes against detained Palestinian children.